I had the honor to serve as a crew leader for the Coast Salish Mini University this summer ’16 alongside my younger brother for the Lummi Nation. 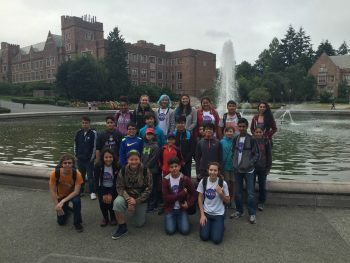 Through grants from the San Juan Island National Parks and other partnerships, 12 Lummi youth were given the opportunity to return to their ancestral lands and serve as the environmental stewards of their native lands. Through conservation projects and curriculum that integrated traditional ecological knowledge and ancestral practices, the youth were empowered to take care of the islands by removing invasive species, locating forage fish sites, and participating in the canoe building project led by Uncle Dean Washington. The canoe building project integrated western engineering technologies and software as well as STEM principles that showed the youth that our ancestors were indeed the true founders of science, engineering, technology and math, despite the little recognition they are given for their immense societal advances. Reviving ancestral knowledge to increase the number of indigenous scholars in the STEM field is one of my motivations to incorporate our way of life into the various projects I participate in. The work with the Lummi Nation is part of my doctorate work with Dr. Kristiina Vogt at the School of Environmental and Forest Sciences. Our lab’s project involves teaching indigenous and native youth coding to grant them the tools to generate and develop apps for the tribes to help them combat climate change. 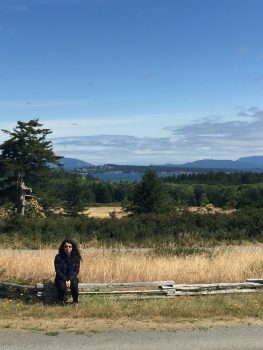 I really learned a lot from this summer work and had a wonderful time camping in the beautiful San Juan Islands. Upon my return, I served as a teaching assistant for the UW NASA Space Consortium/ NESSP summer camp. Our students were given the opportunity to immerse themselves in the STEM fields for four weeks while receiving the mentorship of various guest scientists from the CoEnv. The mission of the camp was to encourage our youth to enjoy an active lifestyle, discover a respect for he natural world and to develop a deeper understanding of the sciences. I learned a lot by participating in this camp and helping align and develop the curriculum with the Washington and Next Generation state standards.